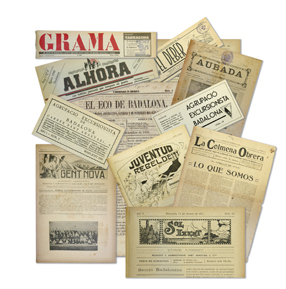 The Newspapers and Periodicals Archives hold more than 300 titles of publications printed in Badalona since the mid nineteenth century and constitute the most comprehensive collection of printed material from and about Badalona in the world. Its origins date back to the collections of local press that Badalona’s Local Council kept in store since the nineteenth century, and those gathered by the Museum itself since its foundation in the year 1955. In 1994 the collections were enlarged through the acquisition of a voluminous amount of periodicals from the “Fundació La Caixa” library. It is also worth noting the importance of contributions made by private donors throughout the years as well as those made by institutional instances, and in particular the collection gathered by Josep M. Cuyàs i Tolosa, subsequently donated to the Museum by his family. It comprises all publications produced and distributed in Badalona since the nineteenth century, whether they be general weekly periodicals, sports magazines, satirical papers, political parties and trade unions press, local publications, schools and societies newsletters or magazines among others. The local newspapers and periodicals catalogue includes 321 titles indexed by title or chronological order. The alphabetical index specifies full title, subtitle and number of issues. Some of these can be consulted in their digital version. The chronological index organizes titles by years of publication. It includes articles related to Badalona which have been published in a number of newspapers and magazines of a wider scope. The collection, which spans from the year 1886 to nowadays, has been chronologically indexed. This subsection comprises 50 boxes and can be consulted from a chronological catalogue.